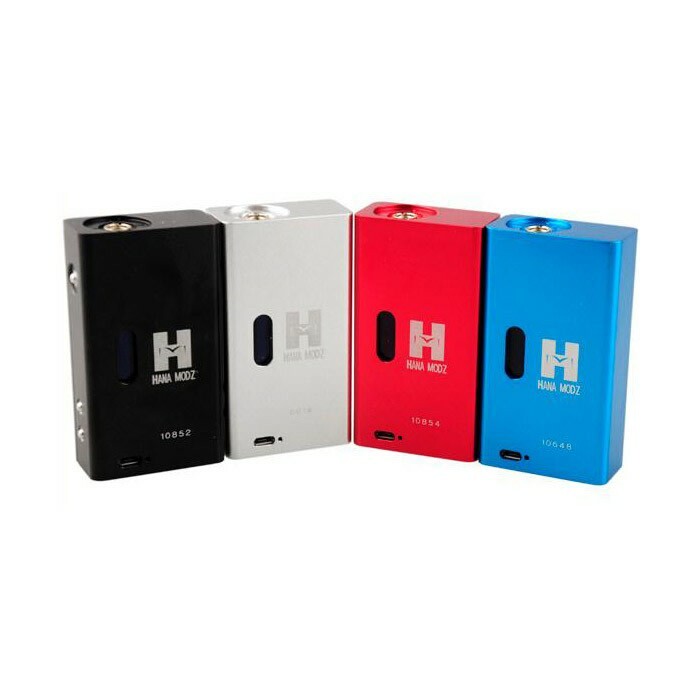 Sorry, Hana Modz 50W Box Mod has been discontinued. The Hana Modz 50W is an advanced box mod with variable wattage and sub-ohm capability, using the DNA50 controller chip. The Hana Modz 50W uses one high drain 18650 battery, not included, and also acts as a charger for the battery through its micro-USB port and its included USB charging cable. Uses 1x 18650 battery, not included. The Hana Modz 50W is an advanced box mod with variable wattage and sub-ohm capability, using the DNA50 controller chip. This advanced box mod is designed for optimum vapor production on both regular and sub-ohm tanks. It is meant for the more advanced vaper looking to either rebuild their coils or utilize one of the high quality sub-ohm tank systems also available from 180 Smoke. The Hana Modz 50W uses one high drain 18650 battery, not included, and also acts as a charger for the battery through its micro-USB port and its included USB charging cable. It is available in black, blue, and red.